A long porch often poses a decorating challenge, particularly if the space is narrow. Outdoor furniture, porch swings and other accouterments are often bulky. Choosing the right type of furniture and other decor allows you to complement the style of the exterior of your home and allows room to comfortably walk across the porch when entertaining family and guests. Many enjoy the outdoors from their porch. Pick outdoor furniture that complements the exterior of your home, whether it is Victorian, country or Cape Cod. Wrought iron or wicker is appropriate for a Victorian home and teak is perfect for a colonial style. Set the furniture as close to the exterior of the house as possible. Angle the pieces toward each other slightly to provide a conversation area. Pick small rectangle-shaped or round tables to set between chairs. These provide an area to set beverages or other objects without taking up too much floor space. 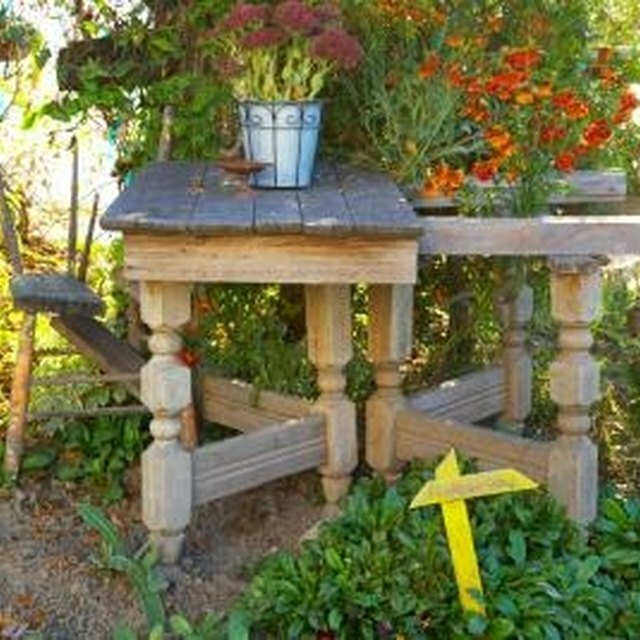 Place narrow benches on a long, narrow front porch to provide seating and space to walk along the porch. On this type of porch, it's wise to have seating on either end to create separate conversation areas and balance. Place potted plants on the porch railing or tall, narrow plants on either side of the front door. Hanging baskets work well for this type of porch because they don't take up any floor space. If you want plants near the seating areas, set them beside the chairs, in between pieces or as a centerpiece on a small table. Set a mat in front of the front door to add color and texture to the porch. This also prevents soil and grass from being tracked into your home. Choose a plain mat or one with a design that complements the other decor. Hang wrought iron or other weather-proof wall art on the exterior of your home instead of adding additional decor to the floor space. This adds design, color and texture to the porch. Some long, narrow porches are just wide enough to have a porch swing on one end. If this is not the case with yours, purchase a glider. This enables two people to sit together and swing, yet doesn't require as much space as a porch swing. Avoid positioning potted plants near the porch railing. This takes up too much floor space and makes the walkway difficult to maneuver with other furniture.